A week ago my husband and I attended the 2017 Worldcon, this year held in Helsinki, Finland. It’s taken me a few days to write up my thoughts, but better late than never. Every year the Worldcon – the World Science Fiction Convention (also covers fantasy, horror etc.) – is held in a different location. Often it’s in North America, so it’s quite exciting if it’s elsewhere. I was last at the Worldcon in London a few years ago, and was determined to go again if it came back to Europe. Two years ago I was a site selection voter for Helsinki, and delighted to be able to go there. The venue this year was the Helsinki Convention Centre – the Messukeskus. As a Finnish convention the programme of talks had a substantial Nordic content, including some talks in the Finnish language. And it had a massive turnout from Finnish members. Normally a Worldcon held in a non English speaking location gets around 3000 attendees through the doors over the five days. This one had over 7000, including a vast number of local memberships sold in the weeks before the con. This caused problems for overcrowding in a venue which had been picked based on the smaller numbers. Rooms were over full, queues too long, corridors jam packed. But the con organisers took drastic action, and limited new members after the first day. I can’t remember this being done at a Worldcon before, but think it was a good decision, and it was effective in reducing the problem. However even in such a huge event with thousands of attendees it did feel remarkably intimate. Even though we’re not active participants in the fandom scene we did keep running into the same people over and over again, including fellow Scots. It actually reminded me of being an undergraduate student at St Andrews in Scotland, where you could rarely walk into the town without running into someone you know … On that subject I met an online UK friend at the con – we hadn’t arranged anything in advance, but he saw one of my tweets saying which talk I was going to next, and was able to come and find me, and we had a great chat. I also had a very memorable breakfast chat with a US fan from Illinois. As well as taking drastic action to cope with the overcrowding issues the con, as is usual for Worldcons, was highly organised around making it accessible. For example at registration on the Wednesday we – including me in manual wheelchair – were able to go straight to the special access desk, thus avoiding the longer and winding main queue. But there were still some problems. Lifts were probably too few for the numbers needed, and often busy, both in the main hotel building (which shared part of the convention complex) and elsewhere in the convention centre. Particularly problematic for us was a huge ramp in the main convention centre, which we had to get past to get to the main trade and exhibit halls. I could never have wheeled myself up there. And there were frequent problems with people walking along looking at smartphones, and threatening to walk into wheelchairs which could not just step easily to the side to avoid them. Very much a modern malaise of course. Because of my neurological illness, similar to multiple sclerosis, I had to alternate days of total rest with days at the con. So allowing for flights there and back I could only attend the con on Wednesday and Friday, with total sleep days between. Luckily the hotel was quiet – because of my wheelchair and mobility issues we were allocated a room in the on-site Holiday Inn. This let me come back to the room and rest between panels, and manage as much as possible. Before the con I studied the programme – released online some weeks in advance – to see likely things I might hope to get to. There were hundreds of talks to choose from, in ten or so parallel streams over five days. I tend to prefer panels with multiple members over individual speakers, unless I’m confident the one speaker will be good. And I always hope to have a variety of subjects covered in the panels I attend. My plan was to attend on the Wednesday and Friday, but also marked up Thursday and Saturday possible events, in case I was stronger on those days. We were flying home on Sunday afternoon, so after checking out from the hotel were going to head straight to the airport. The first panel I attended was “Uses of Fantasy” in the Academic track, a 90-minute academic panel looking at research into audience responses to the Hobbit trilogy of films, especially in Finland. This was a fascinating start to the con for me, an academic historian who researched historic reading habits for my PhD. But I also increasingly dabble in cultural history, including in the modern era. The speakers were a mix of prof, post doc and PhD student, all interesting. All very different in presentation styles, but well linked. There was much amusement among the audience about Finnish attitudes to Hobbit films: essentially huge disappointment! And there was a lively Q&A session at end. I asked my first question of the con, and another questioner was also a Scottish lady. My second panel looked at the processes behind the Helsinki Worldcon bid, from original idea through to the con of now. This had three speakers, somewhat variable in quality, indeed one I wish had spoken less, and given the others more space. But it was an interesting insight. I was also greatly amused by the tartan tammie wearing Finn on the panel with a Scottish twinge to his accent – turned out he’d done his language residency in Edinburgh, and clearly still felt close to the country. Nice! I had hoped to attend more panels on the first day, but in the end couldn’t keep going for so long. So my next panel was on the Friday, looking at Caribbean SF. This was in a large room on the ground floor, and I was pleased to see that the chaotic queuing of the first day had improved. Again because of the wheelchair I got a seat at the very front. Originally this panel was intended to be three Caribbean authors including chair, but a 4th author was added. This was very very good – a rich insight into the language, culture and society of the islands, and what makes Caribbean Sci-Fi and Fantasy writing unique. Each of the writers – including luminaries Karen Lord and Nalo Hopkinson – talked about their own writing approaches. And, yet again, there was a lively Q&A at the end. I asked for tips re starting points for new readers of Caribbean SF, and got many useful suggestions. Because of the still somewhat busy talks and corridors – even after steps had been taken – we didn’t try to attend a panel more often than every two hours. This gave time to get from the previous panel to the new location, ready to queue again. As a wheelchair user I was usually seated first, but it was still sensible to get there before things got too hectic. Both my husband and I had “Access” ribbons on our Worldcon membership badges – him as my assistant – to give us priority access through crowds etc. My second Friday panel looked at the James Webb Space Telescope, one of many astronomy talks at this year’s Worldcon. The speaker in this case was NASA public affairs officer Jenny Knott. So not a scientist, but I think she coped pretty well with questions. It was rather unfortunate that this talk was scheduled directly against another astronomy one about Mars, but both my husband – whose day job is in space technology research for the European Space Agency etc. – and me preferred to try for the telescope one. Much of the talk was a pre prepared video explaining the science behind the telescope and the plans for its launch and deployment. The rest of the time was a lively Q&A. Many people, including me (on my 4th question in successive panels), asked about the risky aspects of the mission, and about testing etc. It’s using a lot of new technology; if things go wrong it will be very hard to fix long distance. The speaker couldn’t answer everything, but again I think she did pretty well, and offered to put people interested in knowing more in touch with NASA scientists who can help more. I had intended to go to a panel on Finnish steampunk, but went for lunch instead, and another look around the trade hall. So after that I looked in the programme book to see what else that might be on imminently that could appeal, and ended up in a panel on “Writing for Video Games”. This had five writers for video games, including three writing for interactive fiction company Choice of Games. I’m writing interactive fiction games myself at the moment, and have been interested in them for 35+ years; so am always hoping for inspiration re my own writing, which made this panel ideal. It was an interesting discussion, well balanced among the panel, and touched on lots of issues, including the role of the writer, developing a character, and agency. Again it wrapped up with a lively Q&A. I was trying not to ask a question for a 5th panel in row, but gave up after 5 mins. I asked the panel for their thoughts on how easy it was for amateurs to get into this field, based partly on the long tradition of amateur writers in interactive fiction in particular. This led to further questions, where audience members were asking for more details of free / open source systems like Inform 7, Choice Script etc. Note: both of the last two panels mentioned above can be viewed on YouTube. Because both were in room 208 they were some of the few recorded and streamed on the Internet for viewers long distance. I should also comment on other aspects of the con. I’ve already mentioned how easy registration was for us. In a large part this was because of the access desk, but looking across to the main registration queue it seems to have been remarkably efficient for people in general too. The Exhibits Hall was rather sparsely filled, certainly in comparison with London. There were lots of posters, but for me from my wheelchair position they weren’t always easy to read. We did like some of the displays though, including Discworld figures, and a huge Discworld Great A’Tuin turtle. All attendees get a registration pack, including a souvenir book and various bits and bobs. I was particularly pleased to see that the souvenir book – a large format paperback – includes good articles about the history of Finnish SF and F. And as a real bonus we got a specially published collection of Finnish weird fiction in paperback form in our registration pack. This would be good enough for me in itself, but it also had the bonus of having lists at the back of it of Finnish SF and F – both short stories and longer novels etc. – available in translation in various languages worldwide. More for me to read! Overall I’m delighted with our time at the con. I could only be there on two proper days, though my husband managed four days. We both had a fantastic time, very rewarding, which in particular has left me with a legacy of much new fiction and non fiction for me that I now want to read. We got to visit a fantastic city – the Finnish people were extremely welcoming – and had a wonderful break. I hope it’s not too long before the Worldcon comes back to the Nordic countries, but this was a wonderful experience. Thank you. Oh and for a glimpse of Helsinki, rather more so than the Worldcon itself, my husband has uploaded quite a lot of photos from his wanders, especially on the days before the con started. Yesterday was the third day of the Worldcon, but my second day there, and indeed my last day. Because of my MS-like illness I need to pace myself very carefully, resting before and after big days. So once the programme of events was confirmed I decided to attend on Thursday and Saturday only. My husband however is attending on all days. First impressions on our return to the convention were that there were more staff and volunteers visible, something I’d voiced concerns about in my last blog post. Security staff were checking that everyone coming in to the events was a paid-up Worldcon member. And there were more volunteers and helpers, including an access lady who was standing by the lift on Level 3, and gave us our proper access ribbons (to be visible for extra help mobility-wise, for me, and husband as my plus 1) to replace the temporary versions we got on Thursday. We also noticed more cosplayers i.e. fans in costume e.g. Luke Skywalker, Princess Leia, Lara Croft, Link from Zelda, and many others. And there were more people generally. That last point caused some problems. In particular a number of rooms were overcrowded in terms of people wanting to get in, but were turned away. In addition I think some panels had been placed in too small venues, including the Doctor Who panel I attended, which was filling up rapidly half an hour before start time, and in the end was standing room only, despite rules introduced that said people without seats shouldn’t stay – at least more fans got to experience the talk, but it should have been in a larger room. Other people on Twitter commented about this in other panels. My first panel of the day was at 10am, a retrospective looking at 1938 in scifi and fantasy, picking up on 1938 being the Retro Hugos year at this Worldcon. The panelists, including Jo Walton and John Clute, really knew their stuff, and gave a fascinating insight into the time. I particularly liked their analysis of differences between what scifi fandom then and now would perceive to have been the best works of 1938, based partly on what we are familiar with, including earlier and later years, but also based on how a 2014 audience defines scifi compared with a 1938 one. For example the panelists thought it unlikely that massively selling pulp magazine “Weird Tales” would have been perceived as scifi, and likewise both “The Sword in the Stone” – which won this year’s Retro Hugo award for best novel in 1938 – and “Out of the Silent Planet” were at the time viewed as respectively a children’s book and a literary work. As someone who voted in the Retro Hugo awards this year I found Jo Walton’s observations on the difficulties voters faced echoed many of my feelings. I only felt confident enough to vote in the Best Novel and Best Dramatic Presentation Short Form categories, and even then I had not read or listened to all of the works, but was confident enough in my assessment that my choices “The Sword in the Stone” and Orson Welles’s radio version of “The War of the Worlds” were outstanding, and I should vote for them anyway. Both won the Retro Hugo, which the panel agreed with, albeit with the caveat that the book would not have been even shortlisted. But I felt quite unable to vote in the short story or other categories, and this is largely because I’m not familiar with the pulp magazines of the time, and the Retro Voting Packet did not include the material. As a book historian I found some of the statistics for the pulps astonishing: circulation figures of hundreds of thousands in North America, which meant that they were the main way many people encountered sci fi, far more so than in published books. A fascinating panel anyway, and remarkably well attended – a packed room – for 10am on a Saturday morning, as one panelist observed. After that we explored the dealers’ hall again. I was particularly keen to get back to the PS Publishing stall, a UK publisher I’ve bought a lot from in the past. 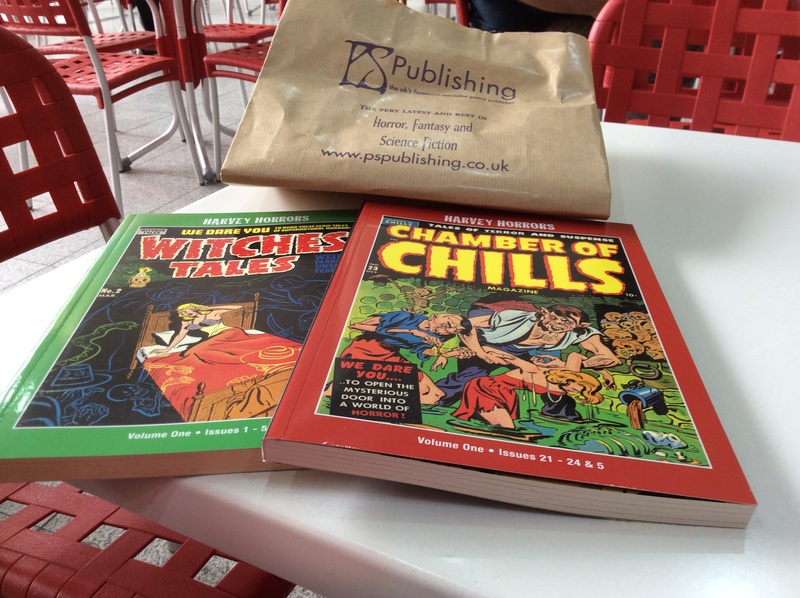 This time I wanted to look through their reprints of 1950s horror comics, which I’d considered buying previously, but being able to flick through them and choose just the ones I wanted was much better. I found out later I got a real bargain: both paperback books for £8 each at the Worldcon stall, versus £14.99 each if bought normally. After that we looked at some more of the displays, and especially those about the history of Worldcons and scifi fandom in the UK. I photographed a bit of a poster about the history of Leeds fandom – Leeds apparently held the world’s first scifi convention in 1937! – and emailed it to my Yorkshire-born Dad, whose Dad was born in Leeds. Then we had early lunch at the Cornish pasty shop further along the boulevard on Level 1. My husband’s paternal ancestry is Cornish, and indeed our surname is Cornish, so it hadn’t taken him long to find that stall the day before and try it out! Tasty lunch, and convenient and quick. And best of all, as we were sitting munching, my husband spotted my former university classmate and friend walking by, and called him over. It was wonderful to see him again. We don’t live too far apart in Scotland, and keep meaning to arrange to meet, but with my fluctuating health it’s difficult. But we were students together, graduating in computer science 20 years ago, and the only two single honours students in our year which had a tiny class size. So we were able to catch up, and had a lovely chat. I also met his academic mother (St Andrews has a system pairing new undergraduates with more senior students – their “academic parents”) which was nice. After this we headed towards my second panel of the day, the Doctor Who Restoration Team. As I said earlier I think this was put into far too small a venue. Fortunately though we got there early, and I was able to nab a good wheelchair space. I twittered about how packed the room was, which gave another friend warning to leave his panel early and come round promptly to be sure of a seat! And I was able to meet someone I’ve only corresponded with online before. The panel was good, though let down a bit by the panelists being out of sight for most of the audience, too low down. Also it was a little too talky, at least at the start, but improved as it went on, and the various panelists got into the nitty gritty of how they do the restoration. This wasn’t just about restoring the visual images, but also how they restore problems with the audio tracks, as guru Mark Ayres explained. We also learned how old material is still being thrown away even now, which was thoroughly depressing. The panel included a number of clips from “Out of the Unknown” which the team has been working on recently. There was also a fascinating question and answer session at the end, including one lady – Scottish no less! – who had worked at the BBC in the 1970s, and had probably created some of the video recordings which the team were now trying to restore. All in all very enjoyable, and very glad that I got to this event in particular. After this my husband and I explored the fan village for the first time. We saw the TARDIS model on display, though the Iron Throne from Game of Thrones had been removed by now. I also picked up some material for the proposed bid for a Worldcon in Dublin in 2019. I’d love to go to that, as someone with a Dublin-born great granny. We even got a Dublin 2019 badge ribbon to add to our growing collection. And then because we were both so thirsty we plumped for cider. Really strong cider! My husband is from Somerset, and he was rather bowled over by it. After that there was time to browse some of the free leaflets, before we headed back to our hotel. As I said it was the last day of the con for me, but I’m delighted I came. I enjoyed all the panels I went to, had great fun in the dealers’ room and displays, and had a great chance to meet friends old and new. Generally I’ve been impressed by the organisation, which has, by and large, run very smoothly. I like the venue used, and as a wheelchair user while here found it easy to get around. I also found all the fans I enountered friendly, smart and cheerful, and a very good advert for scifi and fantasy fandom in general. And yes, if it comes back to this rough part of the world in 2019, I will be back! I’m currently attending the Worldcon sci fi convention, which this year is being held at London, at the ExCeL convention centre on the Docklands. I last went to a Worldcon in 2005, for a day flying visit when it was held in Glasgow. I vowed then that if it came back to the UK again I would attend properly, including travelling if need be to stay in a nearby hotel. And I am. Because of a progressive MS-like illness I have to use a wheelchair for some of the time, especially on longer more intensive days. And this meant that I could apply to the con organisers for suitable accessible hotel accommodation, which for mobility challenged people was largely in the Aloft London ExCeL hotel, right by the convention centre. So that’s where my husband and I are staying. We have a wheelchair accessible room, and being so close to the con has had an unexpected benefit. I’ve been able to return from the con to lie down in the day several times: great when I’m starting to feel really wobbly, and would be impossible if our hotel was further away. The con runs over five days, from Thursday through to Monday, 14th to 18th August 2014. The queues for registration on the morning of Thursday were massive, causing some problems. But because of my wheelchair we were told to skip the queues, go straight to the access team, and were registered with their help very quickly. This left us time to explore before our first panel, and we explored the various eateries in the convention centre. On the downside the dealers’ room would not open on the first day until 1pm – quite late given that people were queuing for registration from 9am. So this caused us to rejig our plans a little, and switch to a different first panel, to allow us time after to explore all the goodies on sale, as well as the artworks and other displays in the same room. There are over a dozen panels on simultaneously at any given time, with many hundreds of scheduled events over the five days. This makes it quite a challenge to pick what to attend: often you find there are multiple things you want to go to at the same time. But it’s nice to be spoilt with choice, and there is some freedom for people to nip in and out of panels as needed. But being prepared helps, and my husband and I both spent some time before the convention, studying the programme carefully and marking up those panels that might be of interest to us. Even then there were some difficult decisions to make! Our first Thursday panel was at noon, an astronomy one, with Professor Tim Horbury talking about the ESA Solar Orbiter mission, which he is actively involved with. My husband’s day job is space technology research, and I studied astronomy for two years at university, so have an active interest in it too. And this was an excellent talk, well judged time and content-wise, with excellent visuals. I found it particularly interesting to get an insight into what it is like to be a principal investigator on a research project like this, which also gave us an idea of what it must be like for my husband’s boss day to day! There was also a lively question and answer section at the end. I asked firstly a double question about how long it would take the orbiter to reach the Sun once launched, and how quickly it would start sending results and how fast they would come back. And then when the answer brought up the issue of results going online I had to ask in what data format – former computer scientist coming out in me there! Anyway that was answered well, as were the other questions. One nice thing about the con is that speakers are given warning about when to stop, and are encouraged to wrap up about 15 minutes before the end of the panel, allowing time for this panel’s audience to leave the room, and for the next panel’s audience to come in promptly. On the downside it seemed – and this may be a misimpression on my part – that there was a shortage of con volunteers around at times. For example there was a blind con goer in our second panel, using just his white stick, who really could have done with a volunteer accompanying him, or at least being in the room and noticing when he needed help. My husband gave him some assistance, but was unable to spot any con helpers outside to take over after. After our first panel we explored the dealers’ stalls, which by now had opened. Much to see, but I was able to resist most temptations. Though I did give in and buy – as expected! 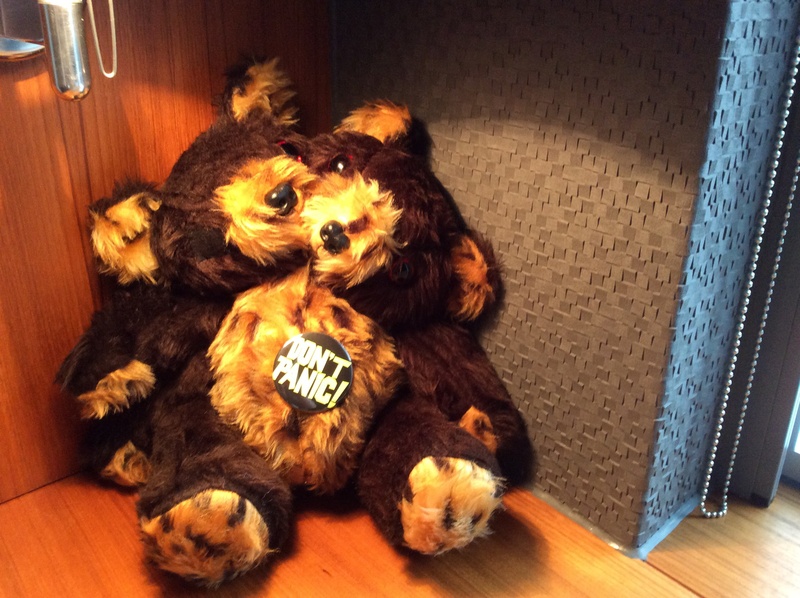 – a second beeblebear for our household: a two-headed, three-pawed teddy bear with eyepatch sold by the Hitchhiker’s Guide to the Galaxy appreciation society, ZZ9 Plural Z Alpha. Normally these are only for sale to members of the society – and I am a member – but today anyone could buy them. And I got a free badge for him (“Don’t Panic!”) and had a good chat with the ZZ9 stallholders. We also took the chance to look at many of the displays and artworks on show. The artworks were generally very impressive, though I thought some artists missed a chance by not having a business card or leaflet with their name people could take away with them. Many of the artworks are being sold over the next few days, and there are some gorgeous pieces available. Likewise there are many displays of items of interest, including a large number of astronomy-related ones, which appealed to us both. And my husband took part in an ongoing experiment where people breathe out to see if they are a methane emitter or not, which provided some amusement! After this we nipped back briefly to the hotel for me to have a lie down – braving the biblical downpour and thunder and lightning outside. Then we were back for the 4.30pm Tolkien Society talk. This is another literary society I’m a member of, and they are sponsoring a number of events at the Worldcon. This one saw David Brawn of HarperCollins, the man responsible for looking after Tolkien publishing for 20 years, reflect on the last 20 years, and how things have evolved, including their links with the Peter Jackson movies. This was a fascinating talk for me, as an academic book historian. The audience was gifted to an eye-opening insight into the publishing world, including some of the difficult decisions they have to make, and the delicate balancing act of respecting the wishes of the Tolkien Estate. I took masses of notes during the talk, noting some of the statistics cited, as well as anecdotes. And it was particularly impressive that the speaker spoke in a very informal ad lib way, working from a minimal set of notes. On the downside he spoke for a little too long, which reduced the time for questions. But what he said was so very interesting, that I don’t think anyone in the audience minded. I asked the first of the three or so questions answered, curious to know more about the Tolkien Estate’s attitude to ebooks, saying for example that I would love to read Christopher Tolkien’s “The History of Middle Earth” series of books in an ebook form. I was rather expecting to hear that the family is not very keen on ebooks, but was delighted to learn that they have adopted them eagerly, though not as early adopters, preferring to allow the technology to settle down, and viewing them primarily as a way of supporting the reading experience. And there are problems with publishing “History” in this format, partly because of how best to handle the extensive linked notes, but more critically because of many strange characters used, which in the past ereaders did not support well. But innovations since mean that it should just be a matter of time before “History” is available in this format, alongside all the other Tolkien books, though probably after the publisher has finished dealing with all the publications linked to the current Hobbit trilogy of films. That was our final panel of the day, and afterwards we met friends for cocktails in our hotel bar, and a good chat, which was lovely. Then dinner, and a fairly early night, after a very long, but rewarding day. I will be resting tomorrow, but my husband will be attending the con while I sleep. I will be back there with him on Saturday, for more eagerly-anticipated panels.